The diagram below shows an overview of the QuBAS system, detailing the two complementary program elements Explorer and Regulatory. 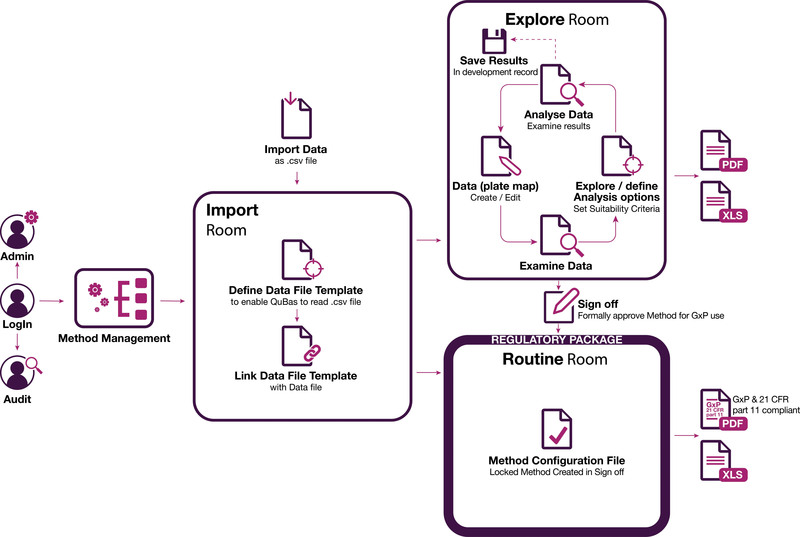 The login area and the import room are common to both elements: The Explorer package is used for developing the analysis and exploring the consequences of different statistical methods and suitability criteria. The Regulatory element of QuBAS is used for creating a GxP and 21 CFR part 11 compliant standard analysis report. The method, created by the R&D user, can be approved and locked down so that it can be used securely by a Routine user. The Routine user simply imports the data, selects the locked method created by the Sign off user and presses go to produce the GxP and 21 CFR part 11 compliant report. The table below details the different user profiles available for both the Explorer & Regulatory elements of QuBAS along with the permissions for each.